Perennial; caespitose. Rhizomes short; pachymorph. Culms scandent; slender; woody. Culm-internodes terete; thick-walled; smooth; distally glabrous. Lateral branches fastigiate. Branch complement many; in a clump; subtended by a bare patch above the node; with subequal branches. Leaf-sheaths glabrous on surface. Leaf-sheath oral hairs setose; 8-10 mm long. Ligule an eciliate membrane. Leaf-blade base with a brief petiole-like connection to sheath; petiole glabrous. Leaf-blades deciduous at the ligule; lanceolate; 4-8 cm long; 6-12 mm wide; stiff. Leaf-blade venation indistinct; without cross veins. Leaf-blade surface glabrous. Leaf-blade apex obtuse. Inflorescence composed of racemes; terminal and axillary. 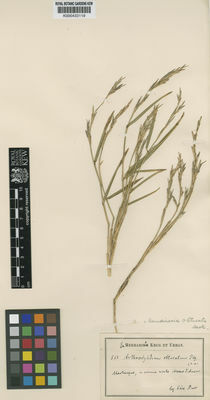 Racemes 1; single; straight; bilateral; 4-6 cm long; bearing 5-7 fertile spikelets on each. Spikelet packing lax. Rhachis internodes 10-12 mm long. Spikelets solitary. Fertile spikelets sessile. Spikelets comprising 2 basal sterile florets; 4-6 fertile florets; with diminished florets at the apex. Spikelets linear; laterally compressed; 12-20 mm long; breaking up at maturity; disarticulating below each fertile floret. Rhachilla internodes straight, or zig-zag. Glumes persistent; similar; shorter than spikelet. Lower glume lanceolate; chartaceous; without keels. Lower glume apex acute. Upper glume lanceolate. Upper glume apex acute. Basal sterile florets barren; persisting on inflorescence. Lemma of lower sterile floret similar to fertile lemma. Fertile lemma lanceolate, or ovate; 8-9 mm long; chartaceous; without keel. Lemma lateral veins prominent. Lemma margins ciliolate; hairy above. Lemma apex obtuse; mucronate. Palea 1 length of lemma. Palea keels ciliolate. Palea apex ciliate. Apical sterile florets resembling fertile though underdeveloped. Lodicules 3; 2 mm long. Anthers 3; 4 mm long. Stigmas 2. Ovary umbonate.